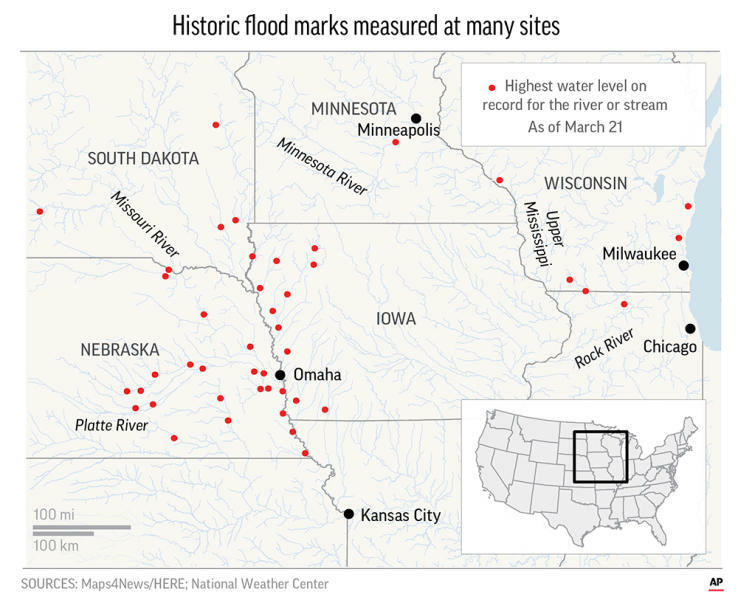 Crests are still coming further south and east on the Missouri River, but flooding in Kansas City and other points in Missouri isn't expected to be nearly as severe. Missouri State Highway Patrol Sgt. Jake Angle says the evacuation began late Friday morning in the city's Lake Contrary area. The river is cresting in the city at levels that are less than 1 foot (0.3 meters) away from those reached during historic 1993 flooding. More than 100 people are sandbagging to shore up the levee that protects the Missouri Air National Guard and Rosencrans Airport. 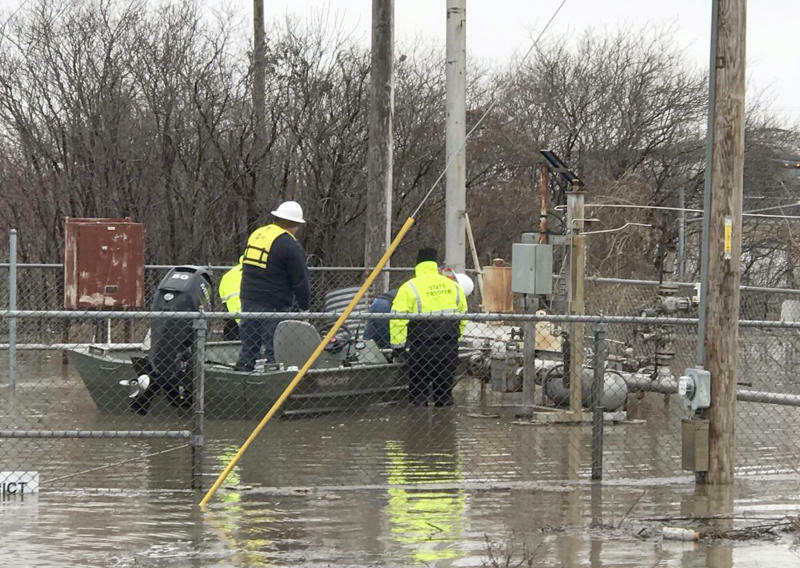 Kansas City Power & Light says that because of the flooding, crews have shut off power to some customers in five communities, including St. Joseph, which has a population of about 75,000. Iowa Gov. Kim Reynolds says recent flooding in the state has caused an estimated $1.6 billion in damage. Reynolds sent a letter asking President Donald Trump to quickly issue a disaster declaration for 57 counties in Iowa that have been severely impacted by flooding, including along the Missouri River. 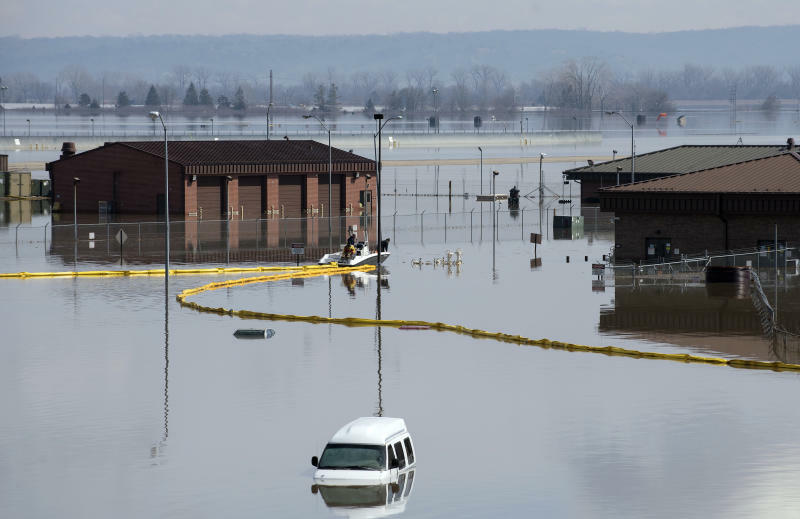 Ongoing flooding along the river has damaged thousands of homes and inundated agricultural land in several Midwestern states. The damage estimates indicate flooding that began last week has caused $417 million in damage to homes with minor damage and $64 million to homes with major damage. Businesses suffered $300 million in damage, while agriculture damage is estimated at $214 million. Additional damage is to levees. More towns are evacuating as the flooded Missouri River seeps over and through busted levees.